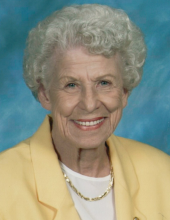 Laura Ellen McCoy, 95, of Spring Hill, Florida, formerly of Ashland, Kentucky, passed away Saturday, January 12, 2019 at her residence. She has gone to her eternal home in heaven. Laura was born December 13, 1923 in Ashland to the late William E. and Mollie Pennington Robinson. Mom lived at a time when women were seldom recognized for their accomplishments, but she was accomplished where it counted. A wartime bride, she worked in a Detroit factory making armaments, while her husband Harry fought the Axis powers overseas. After the war, she settled into peacetime life, married to Harry for all the years until his passing in 2005. She was the proud mother of three cherished sons, and would defend them to the death (although she was not beyond having us get a dreaded “switch” should we deserve it). She loved to cook, bake, can fruits and vegetables, tend her rose bushes and vegetable garden, sew and quilt, read, and most of all, raise her beloved children. And she excelled in all of these pursuits. Yet Mom valued the importance of education, and she herself followed a nursing career in several occupations as an Occupational Nurse and Physician’s Assistant. She loved the Lord, and well into her 80s, she was active within her church, Northcliff Baptist Church in Spring Hill, where she was in the quilting ministry “Threads of Love,” making lap blankets for those “old folks in the nursing homes.” Old fashioned yet progressive, spirited yet gentle, and tough as nails (a shared trait among all the Robinson siblings), Mom was one of a kind. We’ll miss her greatly. In addition to her parents she was preceded in death by her husband Harry Clifford McCoy; four brothers James E. Robinson, George L. Robinson, Homer Robinson and John W. Robinson; and four sisters Amanda (Lucy) Price, Vivian Renfroe, Goldie Holbrook and Opal Yoh. She leaves behind three sons H. Patrick McCoy and Tim R. McCoy, both of Spring Hill, Florida and Jeffrey S. McCoy (Nancy) of Union, Kentucky; one sister Lora Rose of Westwood, Kentucky; three grandchildren Dr. Sean K. McCoy (Angela), Bryce A. McCoy and Seth B. McCoy; along with a host of extended family and friends. Funeral services will be conducted 2:00 PM Saturday, January 19, 2019 at Caniff Funeral Home in Westwood with Pastor Ivan Asbury officiating. Burial will follow at Rose Hill Burial Park. Visitation will be Saturday from 12-2 at the Funeral Home. To send flowers or a remembrance gift to the family of Laura McCoy, please visit our Tribute Store. "Email Address" would like to share the life celebration of Laura McCoy. Click on the "link" to go to share a favorite memory or leave a condolence message for the family.